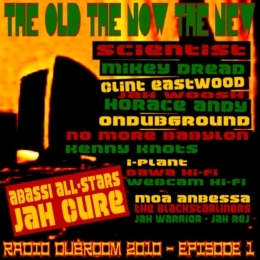 WWW, May 2010 - In the very first episode of the brand new Radio Dubroom Podcast, we can listen to a selection of fine (DUB) Reggae Music tracks, of which with the exception four titles all are available for free and legal download at mp3.dubroom.org. The show opens up with 6 Jamaican (DUB) Reggae tracks from the 1970’s-1980’s. After the introduction Dub, a discomix by Mikey Dread, followed by two DJ tracks and a Dub. That was The Old. We make a quick trip in both time and place, to land in the European continent where there is a large French movement involved in orthodox Roots Rock (DUB) Reggae. Centered around the beautiful Bring JAH Love by Kenny Knots and the French No More Babylon, we get a large taste of French DUB and Roots. Via Moa Anbessa with a heartical, contemporary Roots rendering of the ancient Psalm 63, we cross the channel over to the UK where we find JAH Warrior with a Real DUB from Conscious Sounds Studio, JAH Rej from JAH Works UK and The Blackstarliners. The last three titles are reserved for new releases: One title in two versions by the Abassi All-Stars and JAH Cure’s soulful, spiritual response to the current tribulation in which many Jamaicans find themselves these days, as covered in the Dubroom Message Boards.